Chabad's Terror Victims Project (CTVP) rallied hundreds of volunteers to bring mishloach manos, traditional gifts of food, to terror victims and their families on Purim. There are currently over 3000 such families in Israel who have either lost a loved one or have a relative who was injured in the war against Palestinian terror. These families have to deal with a painful reality every day, including the tragic loss or injury of someone they loved and incurable trauma. 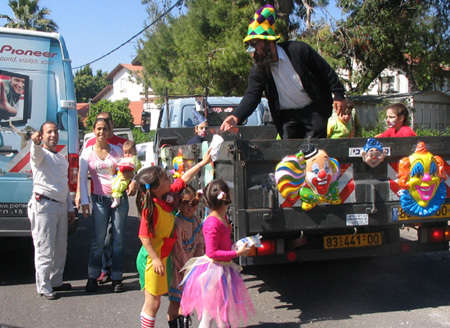 CTVP director, Rabbi Menachem Kutner, has announced that this year volunteers will visit over 3,000 terror victims and their families on Purim, bringing them festival joy and doing the mitzvos of the day with them. CTVP rallied volunteers from around the country to act as the “infantry” of over 300 Chabad Houses countrywide. The volunteers will bring the families a package of mishloach manos and true festival joy. Many family members have said that they feel that most of the public had forgotten their suffering. But CTVP's joyful Purim visits deeply move them and gave them a rare moment of happiness with a feeling of solidarity at exactly the right time. Chabad volunteers will also invite the families to Megillah readings and take part in special celebrations for children and their parents. Needy families were invited to Purim meals in the homes of the volunteers and will take an active part in the joy of the festival.